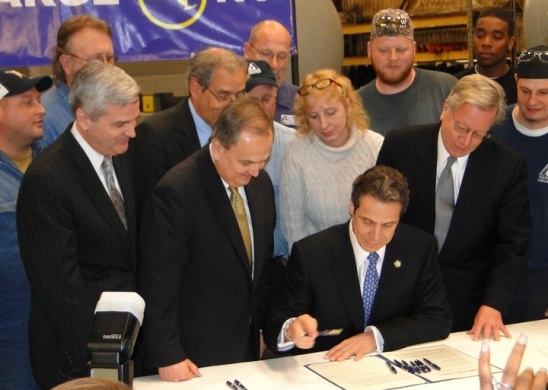 The Niagara USA Chamber was proud to be in attendance on Thursday April 14th, when Governor Andrew M. Cuomo gathered with Republican and Democratic legislators at Ascension Industries, a Chamber member, to sign the “Recharge New York” bill. This legislation which redefines the Power for Jobs program makes it a permanent bill, ending the year to year extenders that have been used in previous years as a new energy policy, has continuously failed to find consensus among the Legislature. Cuomo pointed out that this new program will greatly assist in reducing costs for businesses in a region that has the third highest power rates in the nation. This effort has been in the works for several years. Through the hard work and bi-partisanship of Senator Maziarz and other area leaders and with strong support from Niagara USA Chamber and other advocacy organizations this new program is a major step in revitalizing the region.